I used to work as a hepatitis C nurse, counseling patients and monitoring their treatment, so I looked at this book both as a resource for self-education of people living with hep C, and as a summary of the current state of medicine for nurses and allied professionals. I recommend it strongly on both counts.The writing is clear and engaging, uses patient testimonials nicely to get across the variety of experiences, and offers several levels of detail: most sections should be easy enough for any high-school graduate, but there are more technical descriptions of research findings for readers who want to dig deeper. (Really the only problem I have with the presentation is that those levels are closely mingled throughout, so someone who just wants the big picture will have to skip sections pretty often; it might be better to move things like clinical trial data into an appendix, since the writers' paraphrases of the data are to my eye very clear and fair.) There's a good balance between discussion of antiviral treatment options and practical measures for improving health without the treatment. They're careful not to imply that we know more than we do, and this is a field with a lot of unknowns and some quickly-moving science - but I don't think the 2006 edition has anything that's out of date, except for clinical trials that were ongoing at that time, some of which have gone to the next phase or been stopped (good sources for the most recent developments are hcvadvocate.org and hivandhepatitisc.com).Note, this is a book about the current consensus in (for lack of a better term) Western medicine; the authors acknowledge that they don't know much about Chinese medicine or other alternatives, and neither do I. 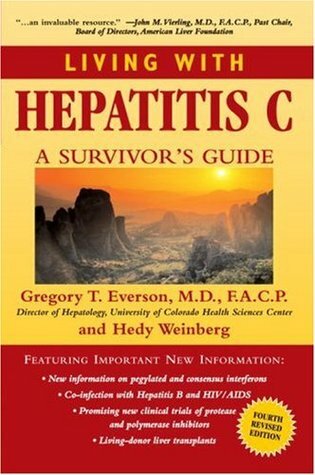 One book I've read that does explore these in some depth isThe Hepatitis C Help Book, which I don't think I would recommend unless you really know your TCM terminology.